Lisa Aldridge: German Apple Cake: One of my favorite cakes in the whole world! German Apple Cake: One of my favorite cakes in the whole world! The first time I saw this recipe, I said, "This is either going to be the worst cake in the world or the best cake ever." Fortunately, it is the best ever! Use any kind of apple, I've tried them all and they all work. I remember one time I set out to make this cake and forgot the cocoa. It was still good, but not perfect, so I immediately made another one; that time I forgot the cinnamon. I was so frustrated, but my perfectionism got the better of me, so I made a third cake! Third time's a charm. I had six sons and one daughter still at home, they were really happy I had made so many mistakes! Beat eggs until foamy. Add sugar and oil, mix well. Add dry ingredients. Add vanilla, apples, and chocolate chips. Pour batter into greased 9”x13” pan. Bake 350* for 35-40 min. This is one of my favorite cakes in the whole world! I use Hershey’s or Ghirardelli semi-sweet chips. This cake is moist and, if there’s any left, I store it in the refrigerator. Enjoy this one. 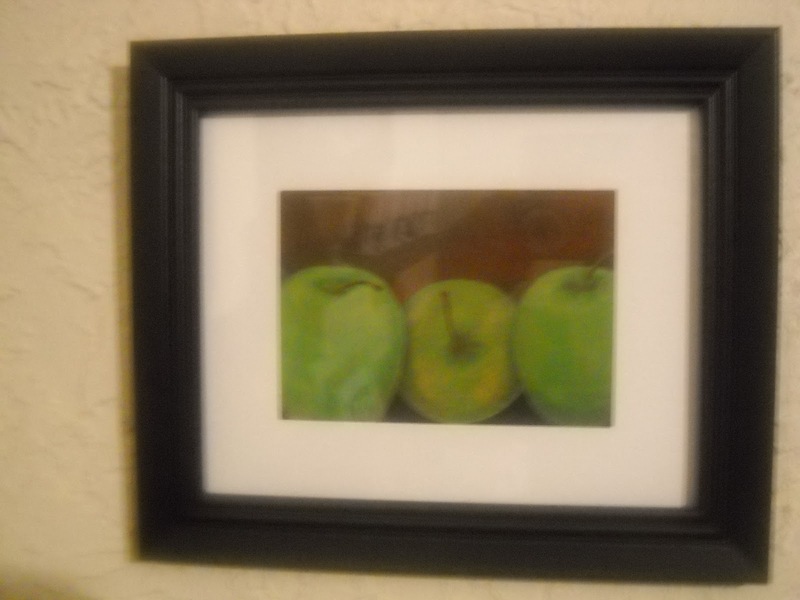 I painted "Three Green Apples" after I fell in love with German Apple Cake.